If It Isn't Love, Why Are Ronnie and Shamari DeVoe Singing and Dancing This Way? 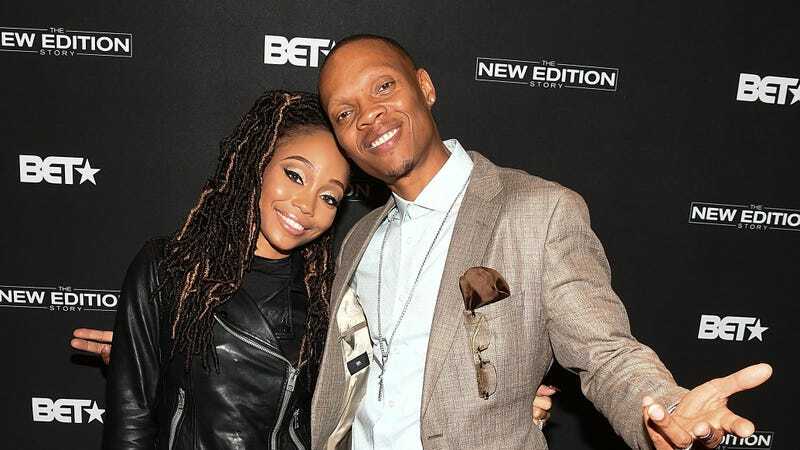 Ronnie DeVoe (R) with wife Shamari Fears DeVoe at BET’s Atlanta screening of ‘The New Edition Story’ on January 5, 2017 in Atlanta, Georgia. If you love New Edition, get into NEW New Edition. Okay, that isn’t the name of Ronnie DeVoe and his wife Shamari’s new duo venture, but it should be. First off, the name of their group is Me and Mari, which I initially thought was a new show on Nick Jr.
Secondly, the pair busted out into what looked to be an eccentric marriage of Temptations/N.E. dance moves. Their album’s name is Shamron. Do they rep Dipset? Yeah. So, what say y’all? Is this your new jam or nah?